Emoona is a new French fashion label, which creates very glamorous designs, emphasizing the strength but also the fragility expressed by women. What I loved about the Emoona designs is this playful, sensual quality, teamed with a nostalgic and decadent feeling of past glamour. In order to bring out the unique in each woman, Emoona only creates a limited number of each design. All creations are numbered. I hope we will get to see more of this label in the future! Really like those green dresses!!! !Great post Amor! great post! !I love the photos! 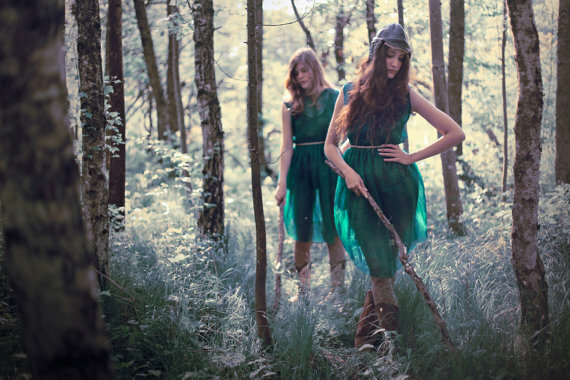 Well, I fell in love with the photos on the first place :) They show women as creatures directly connected with nature, quite like nymphs or Artemis, the goddess of hunting, inherently strong and adventurous, but also fragile and sweet at the same time. The photographer did a very inspired job, to be sure!